I’ve never really thought about doing podcasts, as I prefer to stick to the written word as my medium of choice. I do know a thing or two about audio recording, so I know that buying the right equipment takes a lot more than just picking up a cheap USB mic. That’s why I really like this Podcastudio. 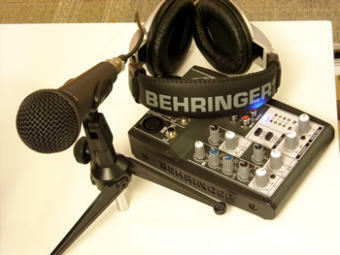 This USB podcast kit from Behringer gives you everything you need to make a decent recording (talent not included). You’ll get a dynamic microphone with a tripod, 5-channel studio mixer with XLR input and mic pre-amp and a pair of nice headphones. This looks like an excellent setup for someone just starting out. The only major drawback is that there is only a single mic pre-amp, which for those that don’t know much about audio, that means you’re only going to be able to use a single mic. At $159, I’d say it’s a good investment.